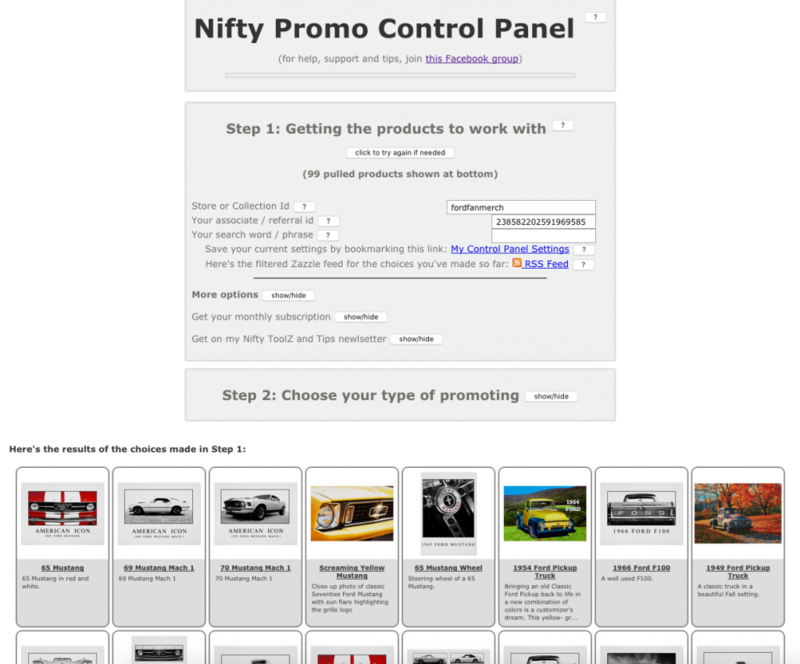 This is a control panel for lots of tools and widgets that help you promote from your own Zazzle store, other artist & brand stores and from the market place. It’s the only comprehensive, time-saving and truly effective set of tools for Zazzle promotion you’ll find. They’re all free to use and don’t require you to sign-up, register or give your email address. Until you get a subscription, they work on a 50/50 referral share – your referral / associate id is used on half the product links, ours on the other half, chosen at random. Of course, you’ll always get all of the royalties due on any sales of your own products. Win/win! Once you’ve set up the products from Zazzle that you want to promote, you choose your promoting tool and you’re good to go. Print out a “live” catalog for events / art fairs / car and grocery store windows, too! See a Blogger page showing an example of each widget – the Linkify one with the magic images is really cool – be sure to check it out! With widgets, you get given HTML code you can paste into your website or blog. They work fine on Wix, Blogger and many other platforms. 🚫 We had to withdraw these widgets. They relied on a service provided by Yahoo! called YQL which, unfortunately, Yahoo! withdrew in early January. Note that Nifty’s share-by-email is so much better than Zazzle’s (which has been known to include their ref id on some links). Clean design, no extra faffle, so you promote only what you want promoted, not Zazzle!